I’ve had quite a few people asking me about the corn garland on my Simple Fall Porch Decorating On The Cheap post (it looks slightly different than the photo above). I actually bought that garland at the Country Living Fair a few weeks ago, but on the drive home it suddenly occurred to me that I could have made the stupid thing myself. Not that the corn garland is stupid, it’s really pretty darn cute and festive for fall. But it looked like it would be fairly easy to throw together and for a lot less than I paid for it! As in I could have bought a vintage thermos or two kind of “less”. Plus I live in corn country, so it’s not very hard to find all things corn related. 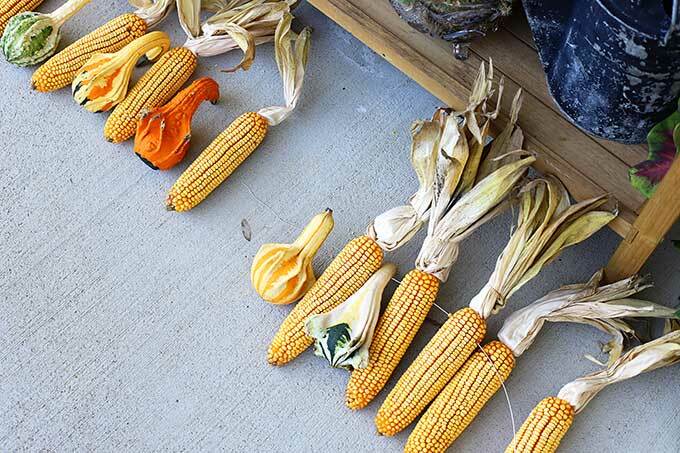 So today I’m going to show you how to make your own corn garland for fall. Don’t be like me and waste prime thermos-buying money on one when you can make one yourself. Steal them from your neighbor’s cornfield (shame on you). 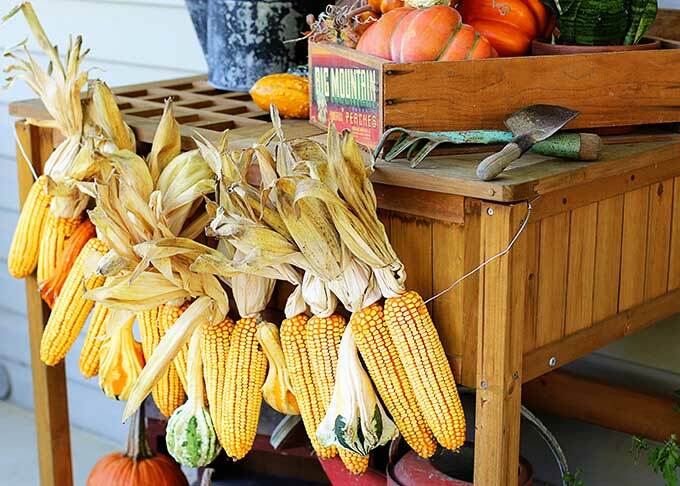 Buy bundles of Indian corn or dried corn that is meant to be hung on your door for fall decorating. They’re usually sold in threes and tied together with wire. Go to your local farm stand that sells bundles of corn stalks for outdoor fall decor and buy some stalks that have corn attached to them. If you go the cornstalk route you just snip off your ears (corn ears, don’t go all Vincent van Gogh on yourself) and pull the husks back to expose the golden corn. Here’s a close up of the wire I used. I bought it at the local Ace Hardware, but you can find something similar at Home Depot or Lowes. Twine will not be strong enough. For some reason having all 12 ears and 5 gourds lumped together makes it heavier than you would think. 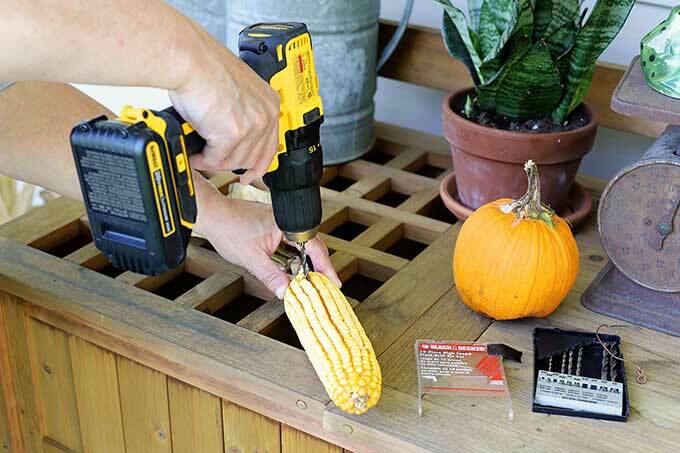 Drill holes through each piece of corn and each gourd. 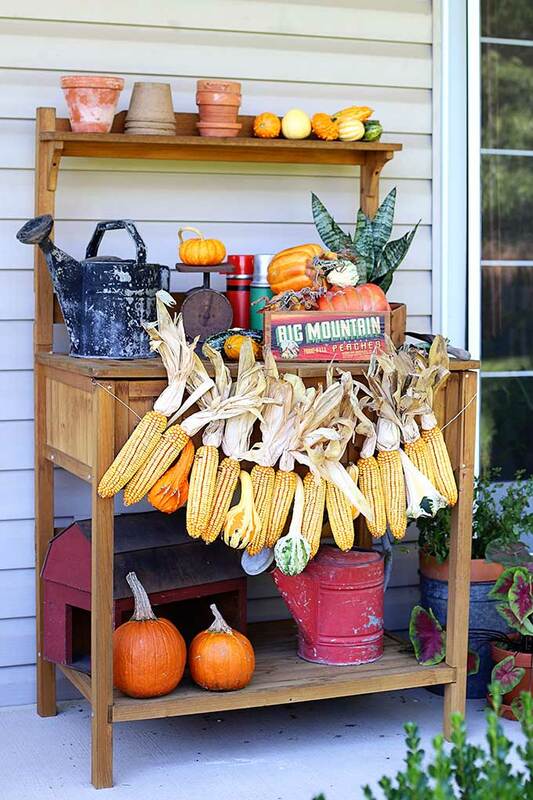 Line up your corn and gourds in a pleasing arrangement. At first, I wanted the garland to be corn-gourd-corn-gourd, but then after eyeballing it I went with corn-corn-gourd-corn-corn in the final version. Do whatever floats your boat and looks good in your eyes. 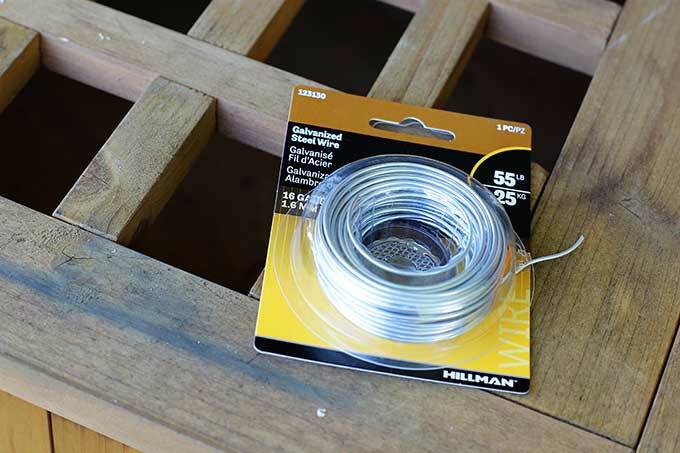 Take your wire and string it through the corn and gourds leaving enough on the ends to make loops for hangers. The wire was bendable enough I didn’t need pliers to make the loop, I just used my girly little hands. I used 5 foot of wire for mine and had plenty on the ends to make the hangers (actually more than I am showing in the photo because the ears sort of settle in together a bit when you pull it up off the ground). 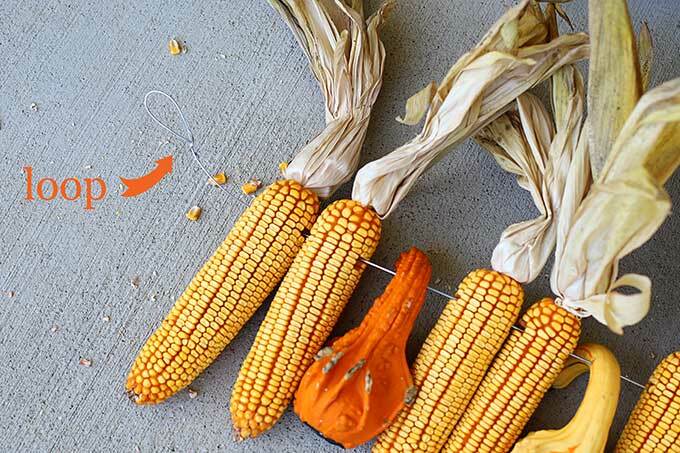 Hang you corn garland up and impress your neighbors and yourself! Where to hang your corn garland? * Would need to be removed if fire is lit, because fire + corn husks = bigger fire and an emergency call to the fire department. I put this one on my potting bench on the back porch. Potting season is over since I basically bought every single mum and kale plant in the tri-state area, so my potting bench is just for looks right now. There’s not too many days left of porch-sitting weather, but I’m going to make them pretty while I can. Just about anything in my Fall Category will get you into the fall spirit. My Halloween Ghosts Made From Gourds is another super quick fall project. 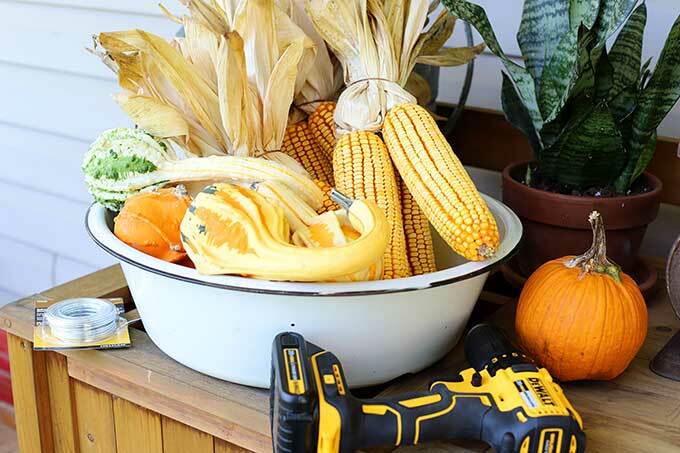 Ideas on How To Transition Your Porch From Fall To Halloween decor is always a winner (not spooky, broken bones poking out of the ground type of Halloween, more a black birds and jack-o’-lanterns type of Halloween). Or if you are feeling hungry, try my Crockpot Baked Apples Recipe. I sure do love how it looks! Pinning! Your corn/gourd pumpkin garland looks so cute. Do the squirrels around your house try to eat the corn? Early morning around here it looks like the movie “The Birds”, only with squirrels instead of birds. I think I am going to try making your corn/gourd garland. 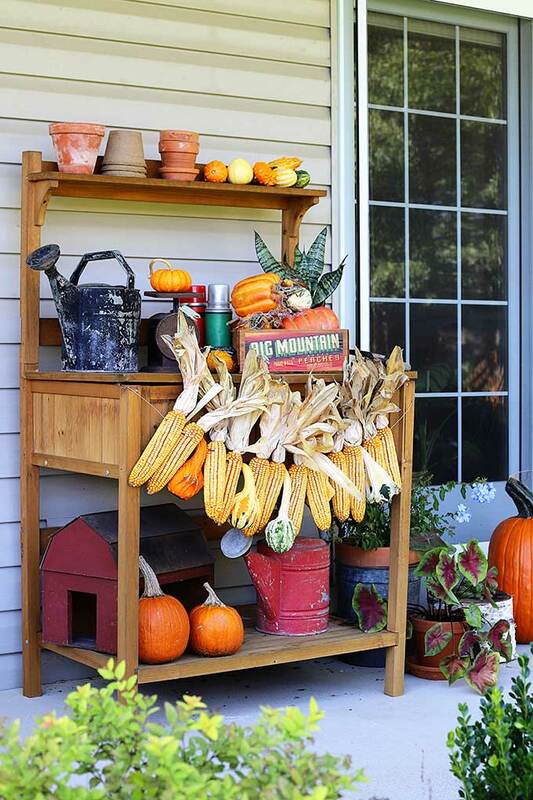 Maybe I will end up with a corn/gourd/live squirrel garland. I was inspired by your garland in the fall and was wondering how I could incorporate pine cones to make a garland to display throughout the winter season. How would you use pinecones?